Two days ago was the first day of Spring. Today we woke up to snow... lots and lots of snow. 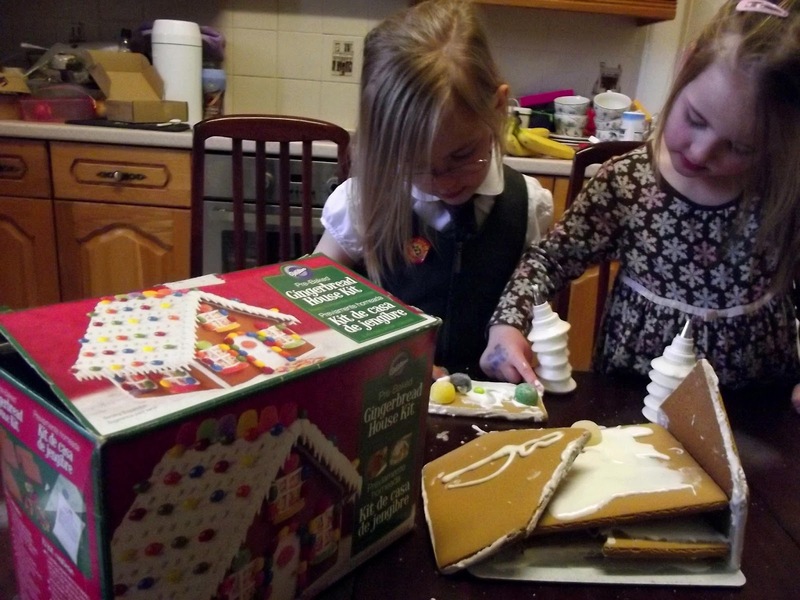 Fifi and Lolly were given a gingerbread house kit two Christmases ago, but we never got around to making it. So it was Lolly who suggested, as we cautiously drove home today from school in the snow, that we make build the gingerbread house today. Which makes sense to a four-year-old, considering snow ought to equal Christmas. 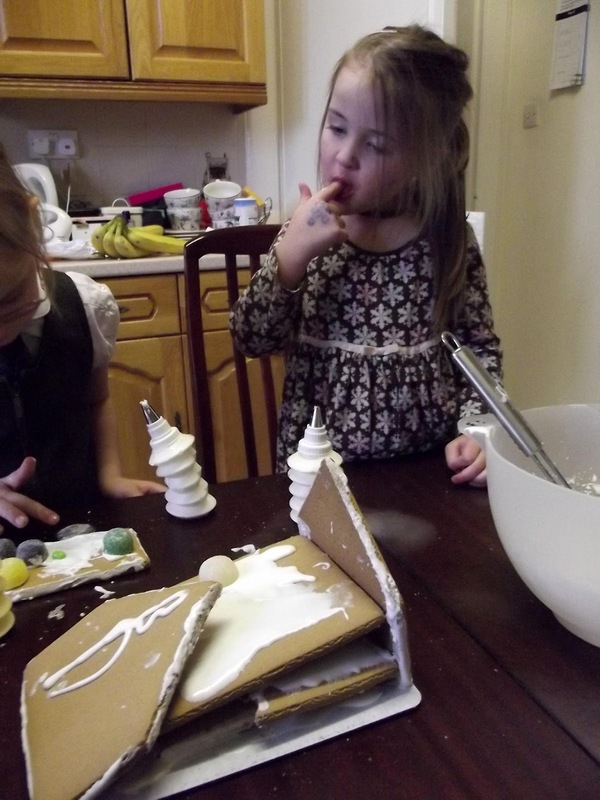 So we got our our two-year-old kit and tried to make a gingerbread house. Or rather, I failed. 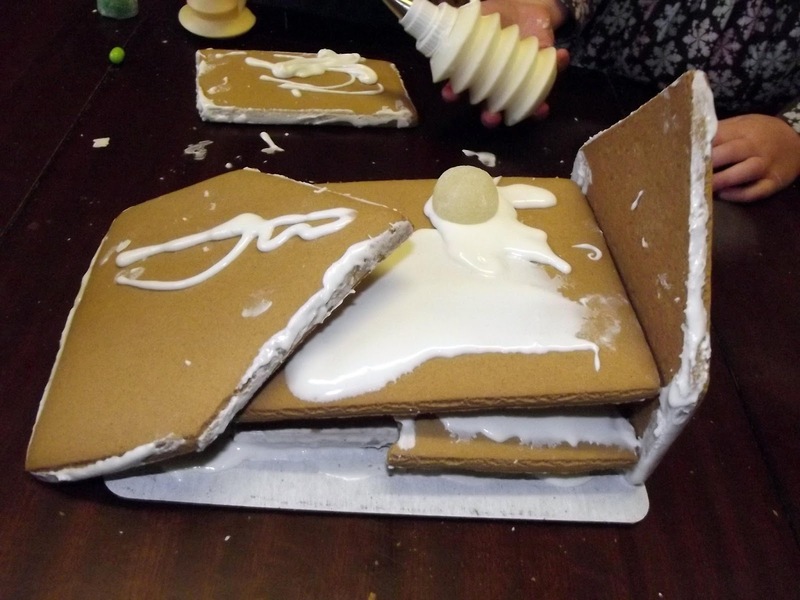 I had the house all built up, but one of the roof pieces was cracked (from old age, I imagine), so I thought I'd be clever and paste it together with icing. Sadly, that just made the roof piece heavier and it collapsed, taking the rest of the house with it. The girls were about to get really upset about it, at which point, I just burst into laughter and encouraged them to see the funny side of it. And after all, I told them, you can still stick sweeties all over it to your heart's content! They eventually got over the fact that their gingerbread house was not going to be a house at all, and just had fun with the icing instead. I bought these cake decorator piping things from Pampered Chef a while ago, but never really liked them. In fact, I had put them on my list of things to sell (please check out the list if you haven't already and BuyMyStuff! ), but using them today gave me a new appreciation for them. 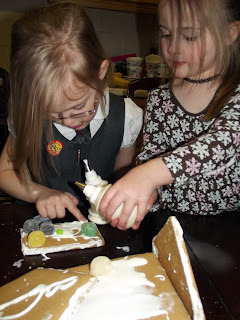 The kids absolutely loved using them. Thus, I have discovered, they do indeed have a use. So I might just keep them after all. I'm not gonna lie... 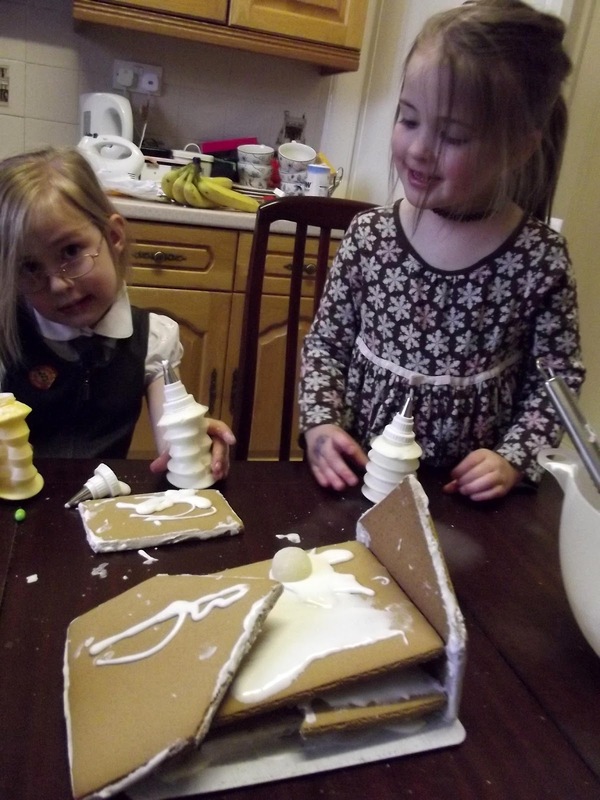 I panicked a bit about them eating the icing. I don't know if icing sugar has a Use By date, but it was sealed, so it couldn't be that bad. I added the water myself to make the icing, so surely it's okay that my children were eating old icing sugar and old, rock-hard sweeties... right? Well, they haven't been sick yet, anyway. And they had a great time. And it wasn't even that hard to clean up afterwards, so result! So, thank you, Devon, for the Friday entertainment, two years after giving us the kit! Our Spring day was full of winter cheer.